Inismara is For Sale with the the Sandman Brokerage for £87,500. 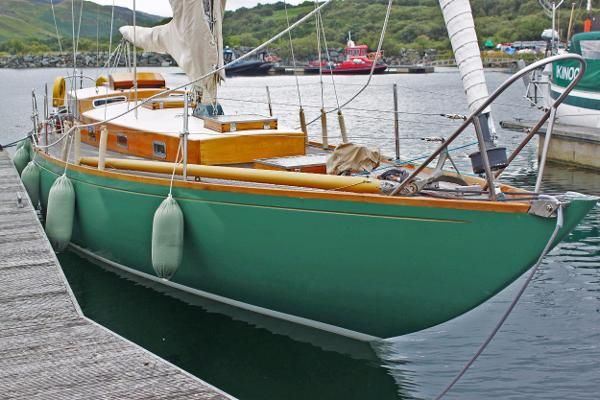 They write that “Inismara is one of the 23 yachts in her class built between 1951 and 1968, displaying her winning ways immediately with 17 wins from 25 starts in her first season. Since then she has benefited from very few owners and impressive maintenance. Original and in apparently fine condition therefore, this yacht is also incredibly nimble under sail just as James McGruer and the Rule intended. On the racing front again, later in the 1998 Scottish Series Inismara won the class overall taking four wins and a second place. She had moreover won her class at West Highland Week two years running in the late 1990s also picking up the overall series trophy. Of late she has been enjoyed as a cruiser and day sailer for which she is equally well suited”.